Halloween for us started in early September, the house was all decorated inside and ready for the season before the weather even changed. The outfit planning started a few months before that in summer. I guess you could say, Halloween is kinda a big deal here. We went through several costume ideas before sticking with the final one. My heart was set on Carlos being Nacho Libre, but as time went on more ideas came to mind. 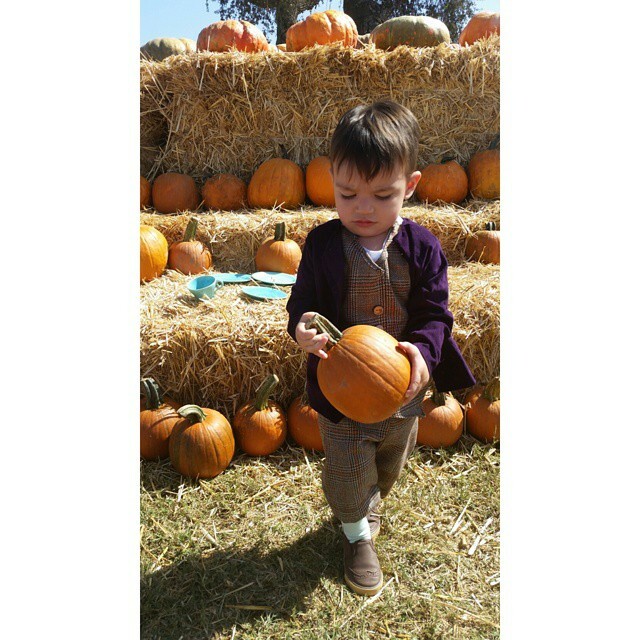 The tough thing about toddlers and Halloween, is that there’s so many great ideas and it makes it hard to choose! 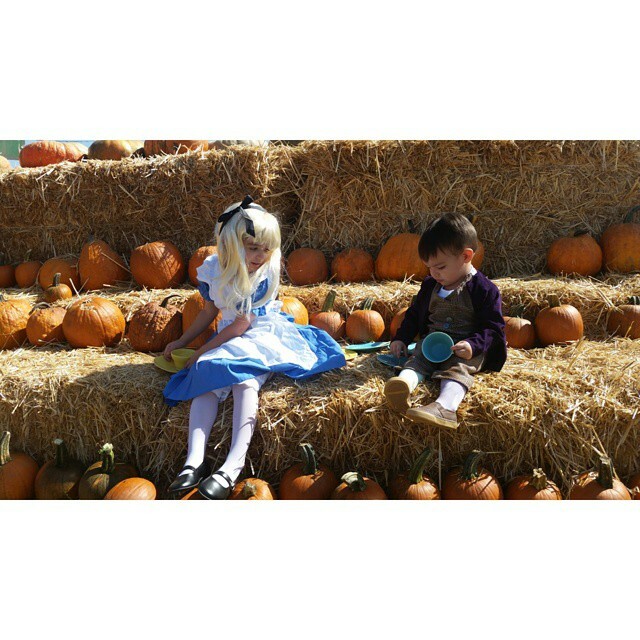 The kids have been in themed costumes that past few years, so want to keep the tradition going while they’re still little and don’t want to be two completely different things. Since Emery is older I was willing to work around what she wanted. It changed a few times, first she wanted to be Olaf with blood on the side of her mouth (her idea not mine). Then she wanted to be The Mad Hatter from Alice In Wonderland. Of course no where in the known universe of 1 million costume shops did I find a pre made outfit, that began my frantic pinning. If Emery was going to be the Mad Hatter Carlos would be The March Hare. It looked like I would be making two costume outfits. 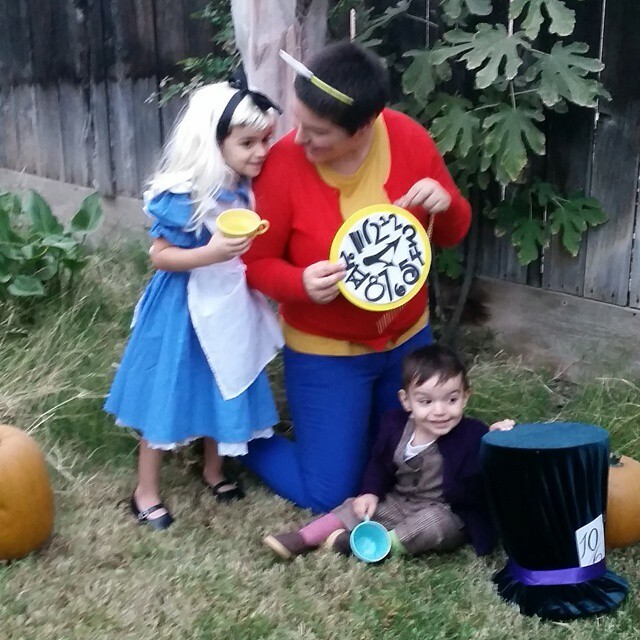 Luckily Emery decided to be Alice and that moved Carlos up to The Mad Hatter. I only had to make one outfit! I don’t like doing things last-minute so I started everything in September, besides I needed the costume done and bought before our Apple Hill trip in early October. Before I even got started I was nervous of the task ahead of me. This would be my first time making an outfit. I’ve made a doll outfit before, a few pillows but that was the extent of it. Now I was taking on pants, a vest and a jacket! I figured if it didn’t pan out and worst came to worst Carlos would be in the dark and it was only for one day. 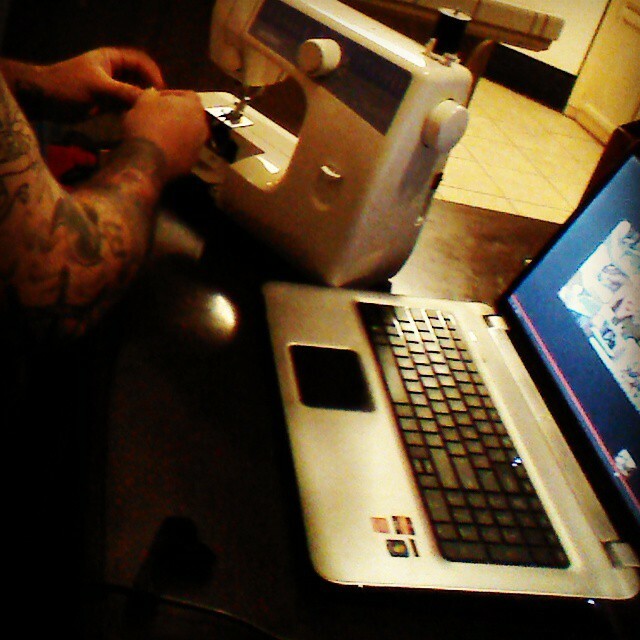 As crazy as that was, my sewing machine wasn’t even working! A month before I tried fixing it with my grandma while watching YouTube videos to no success. My husband (Mr. Fix it via YouTube) tried it and it worked! 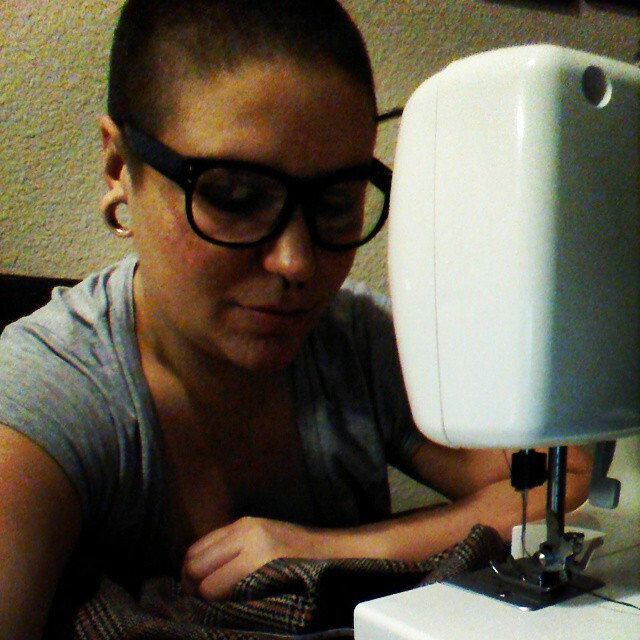 I had my machine, my cloth, my ideas, now time to try to figure it all out. Those are the hands of man who can Google & figure out anything on the web. 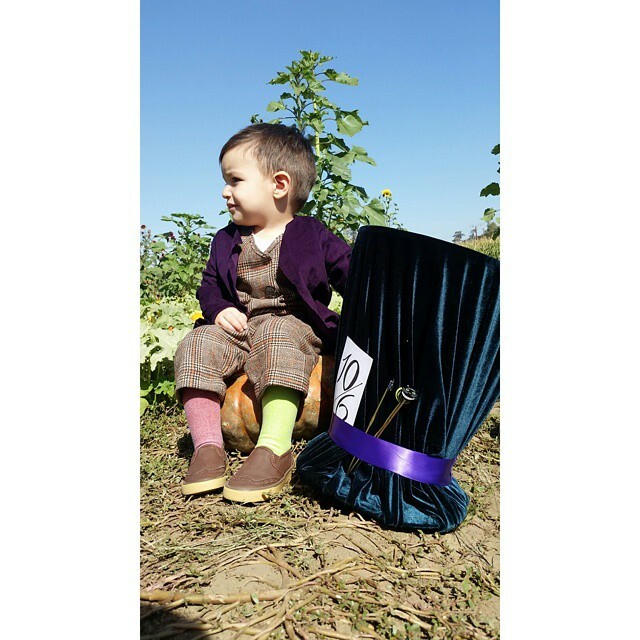 I also had to make the tights the colors I needed for The Mad Hatter outfit. 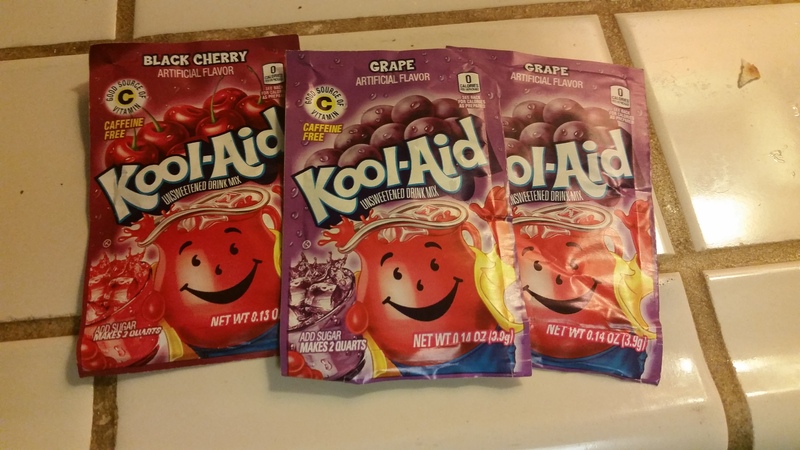 With this I bought white cotton tights and several Kool-Aid packets. 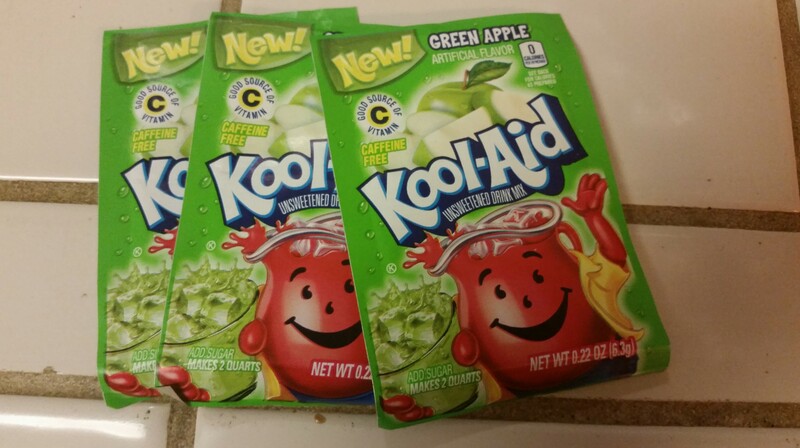 & three green apple packets. This was the only green I could find. I don’t know why anyone would want to drink this flavor but to each their own. STEP 1. 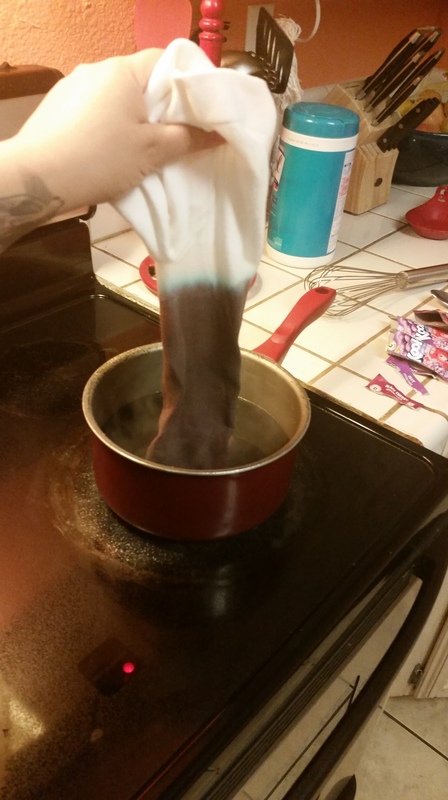 I put three of the purple packets in a steady boil. STEP 2. Since I needed each leg a different color I held the other white leg in my hand so that it wouldn’t stain. TIP: turn the tights inside out because in step 4 your tights will lose that color you loved. STEP 3. Constantly move the tight around so all the color can be even. STEP 4. 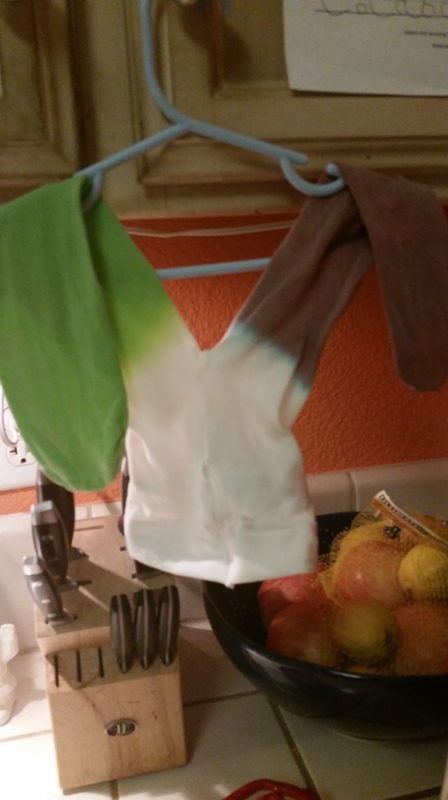 When you reach the desired color take out and rinse in cool water and wring it lightly. You don’t want to get all the color out so be careful, it doesn’t have to be in the water that long, maybe 30 seconds at max. STEP 5. Because we are doing different color legs repeat the from step 1. TIP: I had to get another pot because the color really stuck, so be prepared or save yourself the hassle and just use another pot. STEP 6. Have a hanger ready to hang your end result. Leave it inside out until it is fully dry. I had mine dry over night and I think they were still a tad damp in the morning. Now lets fast forward about a week of staying up at 3 a.m. every night (because my children are crazy and go to bed at 11) to get the clothes ready and here are the end results. In these picture you can’t really see the colors on Carlos’ tights, that because I didn’t realize they were so much brighter on the inside until I took them off. I also made Carlos’ Mad Hatter hat with the help of my husband. I researched on Pinterest how to make the hat and which I would like best. No pictures were taken of that either. If you decide to take on the task of making your own hat, make sure you have plenty of hot glue, some help and plenty of fabric to cover your hat! A staple gun might work better and be faster. Carlos never actually wore his hat, the hat is way too heavy for him and by the time we put all the cardboard in the rim it didn’t fit his head. It’s really nice so we are keeping it for a possible Alice In Wonderland party or a Halloween decoration for next year. Here are the tights inside out and the hat! As you can see it’s pretty big. Emery is really into YouTube tutorials on costume make up, the day before Halloween I was watching one with her and got inspired to be the white rabbit. 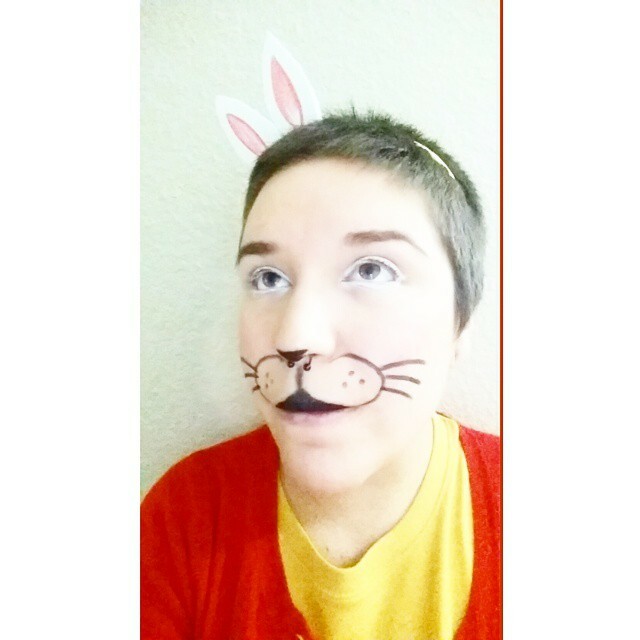 I didn’t really want to dress up because I didn’t feel like making myself anything but I actually had everything I needed to become the white rabbit, all I needed was white eye liner, to make the ears, foam board and a chain that were at Michael’s (my favorite store ever). 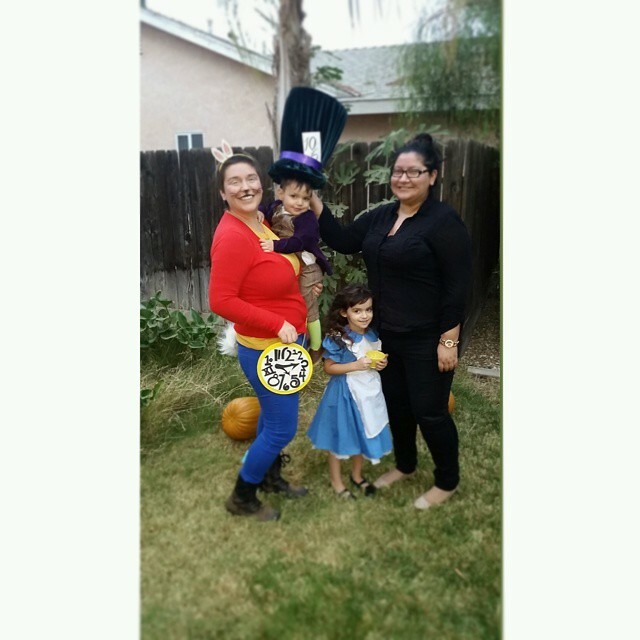 The whole Alice In Wonderland clan! Just when we were done taking pictures in the front yard a black car pulled up. Emery thought trick – or – treaters were here. I said, “no trick – or – treaters don’t come in cars”. A few seconds later Nina Valerie came out! I have bad eyesight so I didn’t even know who it was! Not to mention she had just got a new car so I didn’t put two and two together! Val and Vic had planned the surprise a day before and I was totally clueless. I guess I got both tricked and a treat!